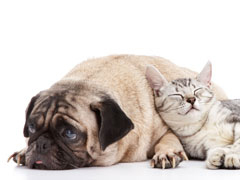 Do you know the normal number of teeth in cats and dogs? To evaluate the bite and to determine if it is right, you should know the correct number of teeth and their normal alignmant. The number of teeth and correct alignment are discussed below. Cats are carnivores like dogs. Their normal occlusion is similar to dogs with significant differences. The upper and lower incisor teeth normally align similar to dogs, with the upper incisors slightly overlapping the lower incisors. In some breeds the incisors align tip to tip (or level). This is sometimes referred to as a "level bite". Notice in the photo below that the lower canines align similar to dogs with the lower canine between the upper canine and the upper third incisor. This is viewed from the front rather than from the side as in dogs. the lower incisors (also with periodontal disease). premolars interdigitate with the lower premolars as in dogs. food. All of cat's teeth have pointed tooth crowns. Persistent lower canines or "mixed dentition"
Never "wait" to remove the primary teeth! Harry Potter front view. Harry has a malocclusion. mandible (lower jaw) is longer than the left mandible. Harry Potter left side view. Harry Potter right side view. Harry Potter front view of the bite. Left mandible (jaw) is shorter than the right. "locks" with the left upper primary canine tooth. shorter than normal but longer than the left side. This is called "wry" bite. in misalignment of the canine teeth. avoid the interlock of teeth. After the primary teeth have been extracted, the jaw length discrepancy may normalize. 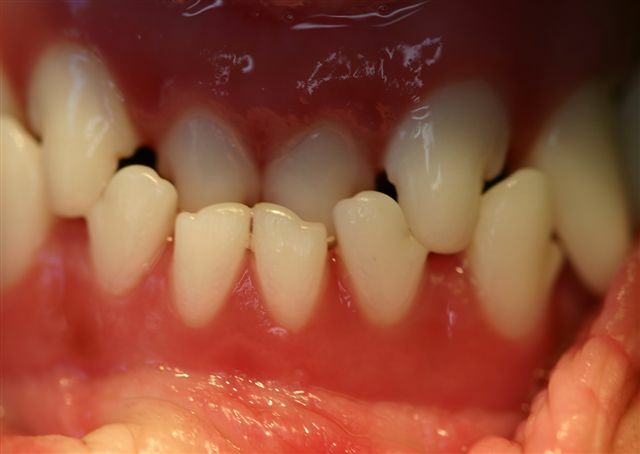 If trauma persists from the malocclusion, crown reduction with vital pulpotomy and pulp capping, or dental extractions are viable treatment options. We want to provide a comfortable bite. Dogs have teeth, and it is useful to know the correct number and alignment of teeth! Puppies have 28 teeth and adult dogs normally have 42 teeth (dental chart). It is very important to monitor the transition from the primary (baby) dentition to the secondary (adult) dentition. During this transition period, the dentition is called a "mixed dentition" (see photos above). Abnormal bites (malocclusions) can develop as a result of failure or slow exfoliation (loss) of the primary teeth, or failure or slow eruption of the secondary teeth. 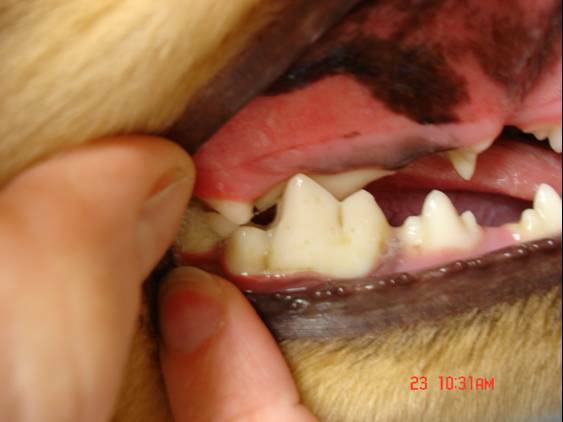 Abnormalities of this transition from the primary to the secondary teeth can result in minor or major malocclusion that may potentially be painful for these dogs. The primary teeth need to be removed immediately in an attempt to avoid the development of malocclusions! To perform these procedures appropriately, dental radiographs are required. Cats have teeth, and it is useful to know the correct number and alignment of teeth! Kittens normally have 26 teeth and adult cats have 30 teeth (dental chart). The transition from the primary (baby) teeth to the secondary (adult) teeth is quicker in cats than in dogs. Our clinical experience of malocclusions is significantly lower in cats than in dogs, however, malocclusions do occur in cats. These abnormal occlusions (bites) can result in problems for cats. Teeth hitting teeth or soft tissues, can be uncomfortable. The question is... Is the bite right? The bite is right when it is normal. The "scissors bite" refers to the normal relationship between the upper and lower teeth. This is also called the normal occlusion. The upper incisors overlap the lower incisors when the mouth is closed (top photo). The lower incisor crown tips rest on the inside cingulum of the opposing upper incisor teeth. The lower canine teeth fit in between the upper third incisor and the upper canine without touching either of them with the mouth closed. In viewing the teeth from the side with the mouth closed, the premolar teeth of the upper and lower dental arcades interdigitate very much like the teeth of a "sheers scissors" (see photo above). Additionally; the upper fourth premolar tooth, overlaps the lower first molar tooth. These teeth function to tear food apart when chewing. 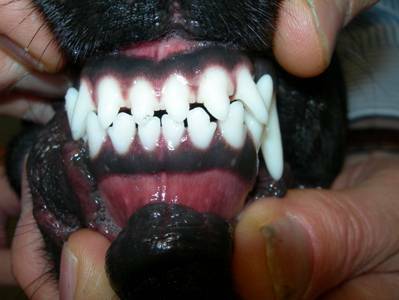 These teeth are frequently referred to as carnasial teeth and are often injured (fractured) when very hard objects are chewed by dogs. We recommend prevention of chewing hard objects in an attempt to avoid fractured teeth! Malocclusions are variations of the bite from the above described normal scissors bite. Malocclusions are classified based on the dental relationships. They are numbered one through three, with a fourth group that does not fit the first three. They are designated "Mal 1", "Mal 2" and "Mal 3". first and second incisor teeth. This is called "anterior crossbite". Go to orthodontic therapy to view Dr. Kressin's management of this case. occlusion (bite). Class 1 (Mal 1) malocclusions are occlusions where one or more teeth are not in the normal scissors alignment. The above two photos are examples of Class 1 malocclusion (anterior and posterior crossbite). palatal defects have developed due to trauma. This condition is sometimes called an "overbite". also has been called mandibular brachygnathism. than 1 inch shorter than the upper jaws. 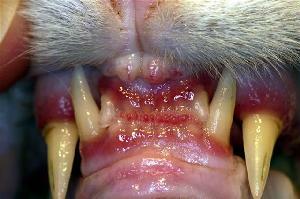 holes behind the upper canine teeth. the upper jaw (viewed from under the jaw). Malocclusions that involve jaw length discrepancy are generally believed to be inherited conditions, however, this author is not aware of research or documentation to prove this belief. This malocclusion is sometimes referred to as an "underbite". The mandibles may be too long or the maxillas are too short in relation to the mandibles. It is also called maxillary brachygnathism. within the alveoli (tooth sockets). Harry Potter "wry bite" or class 4 malocclusion. We routinely see patients with class two and three malocclusions that have painful bites. We refer to this as "traumatic occlusion". Our treatment goal is to provide a comfortable bite for these patients. Treatment options are discussed in detail to allow for informed decision making during the initial consultation. Malocclusions may be treated with orthodontic appliances or by oral surgery. Eli had an uncomfortable malocclusion. View the following series of photos. Eli's normal comfortable right side. Eli's left side is not comfortable. Eli has teeth striking teeth. Eli's malocclusion close up view. the owner chose to treat by oral surgery. This is another Sheltie with a similar malocclusion treated a little differently. Zorro had the lower left canine tooth tipped out toward the lip. This side view demonstrates severe tipping. Extraction of the canine was elected! This is the post operative X-ray. This is the pre-operative X-ray. Orthodontic treatment was also possible! 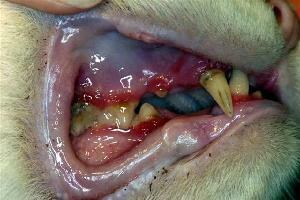 Malocclusion can be very uncomfortable for companion animals. Treatment for these conditions requires an accurate diagnosis in all cases. Treatment planing is based directly on the diagnosis. Some cases are appropriate for "braces" (orthodontics). Informed consent is critically important. Dr. Kressin requires a dental consultation to help make the best choice for the client and their pet. If the bite is not right, there may be problems other than malocclusion! An abnormal bite is most often a dental malocclusion. Other potential reasons for an abnormal bite may be TMJ luxation, TMJ fracture or TMJ dysplasia, and jaw fracture. Dental radiology provides very high detail to differentiate between mandibular jaw (bone) fracture from TMJ (joint) problems. This differentiation is not possible from a physical evaluation alone. Dr. Kressin frequently uses CT imaging ("Cat scans") for accurate diagnosis of these TMJ problems. The great news is that the cost of CT imaging has been reduced due to the case volume we see, and the greater efficiency from increased volume of cases.